Whatever the reason….These Almond Bacon Cheddar Tortilla Roll Ups taste like a million bucks.In case you’ve been living under a rock, the Super Bowl is coming up soon. Will you be hosting a game day viewing party?! I, for one, love the party-hosting part even more than the football-watching part. Although, I must admit I love gathering friends and family together and getting in the spirit for a common cause, rooting for their favorite football team. 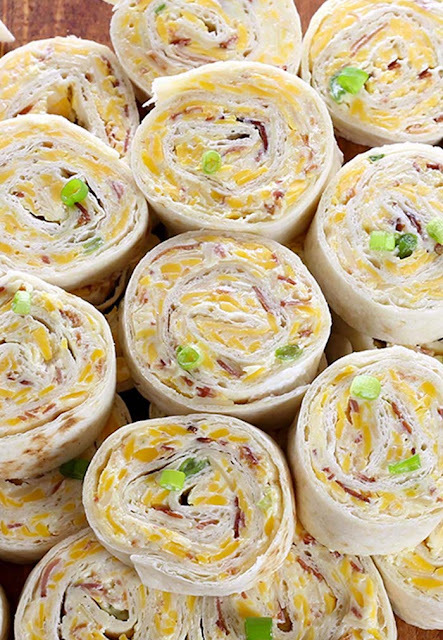 Whatever the reason....These Almond Bacon Cheddar Tortilla Roll Ups taste like a million bucks. In large bowl, combine all ingredients except tortillas until well mixed. Lay a tortilla out on a plate and spread an even layer of the almond, bacon and cheese mixture all the way to the edges (about 2 to 3 tbsp). Roll up tortilla tightly and place on a plate and then repeat until all the ingredients have been used. Pop into the fridge to chill for 2 hour. Slice each rolled tortillas off the ends and set aside. Garnish with remaining sliced green onions. * - make sure your tortillas are at room temperature before you roll them so they are nice and flexible. * -Smaller tortillas may be used, however you will need to adjust the amount of bacon and cheese mixture you add to each tortilla. * -If time is an issue, you can skip the refrigeration before slicing or refrigerate for less time. However, for best results, refrigeration is recommended. 0 Response to "Million Dollar Tortilla Roll Ups"